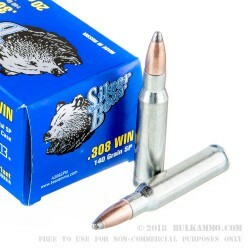 Silver Bear ammo is designed and built for hunting purposes and ideally suited for such. These rounds are built using non-reloadable steel cases with a Zinc coating, non-corrosive powders, and Berdan primers. 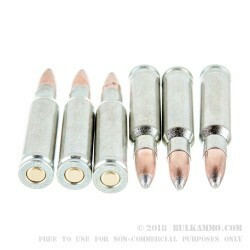 The 308 Winchester caliber rounds use 140 grain SP or Soft Point lead core, jacketed bullets. The muzzle velocity of these rounds pushes 2675 feet per second and hits with a hard charging 2376 foot pounds of energy at the muzzle. These come in easy to carry boxes of 20 rounds. Get some to take out and run your AR10 with now. Silver Bear Ammunition is a subset of cartridges made by the Barnaul Machine Tool Building Plant in Russia. They are the manufacturers of the well-known ‘BEAR’ line of cartridge brands such as Silver Bear, Brown Bear, and Golden Bear. The reason for the difference in the names is due to the difference in how the steel cases are treated during the manufacturing process. The Golden Bear cases have a brass plating, while Brown Bear cases have a brown lacquer coating on them, and finally the Silver Bear cases have a Zinc coating on them.